For basketball fans living in Northern Arizona, catching a professional game used to mean a drive to Phoenix, where the Suns play as members of the NBA. This all changed on a warm spring day in Prescott Valley last month. Appearing with leaders of the local community at an April 12 press conference inside the Prescott Valley Event Center (PVEC), Suns officials announced the relocation of their team’s minor league affiliate from California to Prescott Valley. This move is great news for basketball enthusiasts in the area and, as various dignitaries pointed out, beneficial in a number of ways to both Northern Arizona and the Suns organization. The PVEC’s new tenant was founded in 2006 and known as the Bakersfield Jam. It became an affiliate of the Suns in 2011 and through the past two years was run as a hybrid organization, with the Suns in charge of basketball operations while the Bakersfield ownership group oversaw the business aspects. Last month, the Suns purchased the team outright, assuming control over 100 percent of the operations. After looking at a number of possible sites in Arizona to move the team, including Tucson and Phoenix, officials decided the PVEC would be ideal and chose Prescott Valley as the new home. They changed the team name to the Northern Arizona Suns and the team will begin play in November. Efforts to develop the parent team’s brand have the added benefit of building local community pride. The new team already has a website (www.nba.com/suns/naz-sun) and a presence on several social media platforms, including Facebook (NAZ Suns), Twitter (@nazsuns) and Instagram (nazsuns). The team logo will be revealed in coming weeks, followed by a uniform unveiling and introduction of a mascot. Citing the close link between sports and community identity, Rowley said the public will be invited to participate in these efforts. Also, in a related attempt to generate interest, the team is holding a contest in which a community member will win a pair of season tickets for life. From a financial angle, the Suns’ arrival in Prescott Valley should make a positive impact. The team will play 24 home dates, plus host a handful of special events such as a scrimmage with the parent team, in the PVEC. For these games alone, a significant amount of income will be generated from ticket sales (the arena seats 5,100 for basketball games), refreshments and souvenirs, plus create jobs to handle these needs. 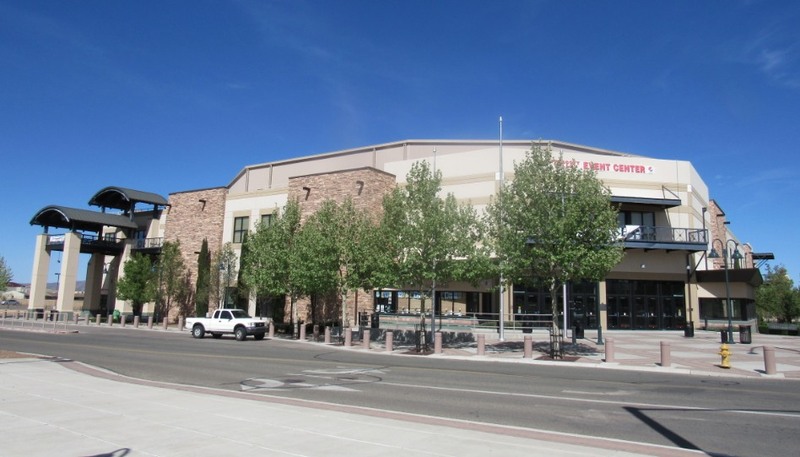 The Prescott Valley Event Center, formerly Tim’s Toyota Center, will become home to the Northern Arizona Suns, the Phoenix Suns’ minor league team.